Today I share a new tool that gives A LOT of information about a suburb so you can make more informed investment decisions. Hey guys. For years, it’s been really hard to find decent data on an area that you’re looking at investing in. If you’re interested in investing a particular area, if you don’t live there, it can be very difficult to know things about that area that you want to know. Things like; even capital growth or crime rates or public housing in the area. What the area is like? What kind of restaurants are in there? Over the last 6 months to 12 months, there’s been a lot of tools that have been coming out that have made life a lot easier for us. And we have a new tool that I’ve actually just discovered yesterday called microburbs.com.au and I’ve got the creator and founder, Luke Metcalfe with me today to talk us through it and how we can use this to better help our investing. Ryan: Hey, Luke, thanks for coming on today. Luke: Hey. Thank you very much for having me, Ryan. Ryan: Okay. So, talk the people through what exactly is Microburbs and why did you start it? Luke: Yeah. Okay. So, Microburbs is a site, totally free site that gives you these detailed comprehensive reports for everywhere in Australia. Our goal is to provide all the information that you don’t otherwise get in property ads and in a format that is really easy to digest. We break things down by all different kinds of qualities of a property like tranquility and hipness and lifestyle and convenience and provide scores of each of those. And then, break down the reasons why. So, for example, under tranquility, we show what kind of land nuisance nearby. Is it near industrial? Is it near public housing? Under affluence, we provide the median price and you can see that on the map as well. The convenience will show you how far it is from train stations and from the city. So, all the kinds of stuff that you might to find out about a property. All these things that you – it’s such an enormous checklist of things, often as negative things, as well. Like, you might be surprised when you move in that you’re in a mobile black spot. So we can answer that for you as well. Or the internet isn’t very fast. So, all these things, we put them into one report for you so that you can be assured that a property is right for you, whether you’re an investor a home buyer. Ryan: Okay. 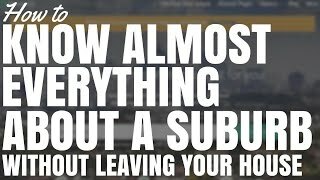 So the purpose of Microburbs is basically for anyone who’s looking at investing in a particular area or if you’re looking at a specific property, you can basically go to microburbs.com.au, you can put in the suburb or you can put in the property and it’s going to give you a whole bunch of information on the demographics of the area, the restaurants and all the stuff. Basically, anything you would ever want to know and even things you wouldn’t even think of about an area. I guess the goal is to make investors confident in their decision and know they’re buying the right property, is that right? Luke: That’s right. Yes. Good point. We do areas as well. You can search of suburbs, local government areas, any level, we cover – post codes. Our big thing is that realestate.com.au and domain.com.au, they’re great to tell you about the house. So, whether it’s got a Smeg kitchen, how many bathrooms it has, but it’s not telling you about the neighbourhood. Obviously, majority of the purchase is actually the land value. It’s the land that cost money. And land is only worth something if it’s near other things. If you all you cared about was the house, then go build a mansion out in the Nullarbor Plain and you’ll save yourself a lot of money, right? So, all these things about what kind of neighbors you’re going to have, what risks that the property faces is really an information gap that we are filling. There’s a large number of government sources out there. There’s other private sources as well and we’re all about putting that all together in one place so that you don’t have to spend ages looking at council pdf’s and spreadsheets. We’re bringing it together and we try and talk about properties in as concrete and conversational way as we possibly can so it’s understable to ordinary people with a bit of knowledge about property. Ryan: Yup. We’ll get into a screen share in a minute, guys, where we’re going to go through this site. So, if you are listening to the podcast, I do encourage you to go to onproperty.com.au/339 to get access to this episode and watch through the video because we’re about to go through that. But before we jump into that, I just want to ask you, of all things that you could be doing and you’ve started and sold successful companies in the past, what made you lean towards the real estate space and, of all things in the real estate space, helping buyers with area research? What made you go for that? Luke: Personal pain is the answer. My wife and I were looking for property. We did it for 18 months and I was making lots of spreadsheets and getting the price estimates from RP Data and looking at a whole lot of stuff. There was always that fear – maybe I’m a more type A personality, but I was aware that we could end up buying something that we’d be stuck with for a very long time and the way our tax system is designed to stamp duty [inaudible 5:19], they do try and lock you into a property for a while. Luke: So, to be able to get all of that in one place, it was just – we went to too many inspections. There were things that when we walked in the door that we realized straightaway, if I saw in my phone that there wasn’t enough coverage or there’s a particular layout that didn’t fit with us, if we had found that straightaway or if we’d seen what the neighbours looked like. These things could have saved people a hell of a lot of time. So this is the site that I wanted when I was looking for a property and I’m happy to hear people often say that, I wish I had that 3 months ago when I was looking. Ryan: I think this is valuable because I speak to a lot of new investors, first time investors, and they do get really fearful and really overwhelmed. There’s so much to know about an area when you’re going to invest and it’s really hard to get access to all that information. You got to go to so many different sites and you have to know what they are. I’ve been in this industry long enough that I know what most of them are, but even still, it’s hard for me to say, okay, here’s a property or here’s a suburb. I’ve got to go 4, 5, 6, 7 different websites to get some of this information. For the everyday investor, it’s going to be near impossible for them. There’s so many people that are held back and say, I want to invest in this, but I don’t know what the area is like. I don’t know what the neighbours are like. I don’t know so many different things. So, I think if we can get those people data in an easy to understand way, then I think it’s going to be happy days for us. So, let’s go ahead. Do you want to share your screen with us and talk us through the use cases that you think people will use the site for. I guess, I would like to look at let’s say I’m interested in a particular area, what can we find out about that area? And then, probably go through, as well, let’s say I’m looking at a property, what can I do to research about that property? So, maybe we’ll do area first and then we’ll go into property. Okay, so here we are at microburbs.com.au. So show us through how do we use this and how can we find information on a suburb? Luke: Sure. So, you land on the homepage and you get a big search box. So, you can type in any address in Australia. Here, we’ll go for a suburb of Lindfield on the North Shore of Sydney. You can see here we give you the median land value. Now, that’s not the price of houses, but what the government considers the price of the land alone and we see here how it grows over time and compare it to Sydney in general. Ryan: So that value of the land, is that like when people get their rates out from the government and you have to pay your taxes based on the value of your land? Is that what that information is? So it’s not necessarily reflective of the market value of the land. It’s more of what the government says it’s worth. Luke: They do look at the market value. So you can see how it’s gone up a lot in the past couple of years. So the government kind of work out what is the market value of the land if you were selling just the land itself. Luke: So, it does reflect. But, obviously, there are certain places where there are extensive buildings on top of it and knew they’re worth a lot and then there are other places that are a knock down. So this is closer to what you would sell if it was a knock down in the sale. Ryan: Okay. Cool. So we got land value, so we can see trends there. Then what’s the Investor Data? Luke: Okay. So here we have the floor space ratio. So that’s very low. Here, you can only have for every square meter of land, you can only have 30 square centimetres of floor space, which means that it’s a very low density area. Ryan: Okay. And is this determined by the council or what’s this coming from? Ryan: Okay. Where is Lindfield in Sydney? I don’t know Lindfield. I used to live in Sydney. Luke: Lindfield is in the North shore. So there’s a train line that runs from the city. So that in a North, Northwesterly direction. Ryan: What’s it near that I would know? What suburb? Luke: What’s that? It’s near Chatswood. Ryan: Okay. I know Chatswood. Chatswood Chase? Luke: Chatswood Chase. Yes. The shopping centre. Ryan: Yup. Okay. Cool. Alright. So minimum subdivision size is 790. Okay, that’s pretty awesome. So if you want to invest in and are and you’re looking at doing a subdivision, this is going to show you, you need a land block size of at least this in order to do a subdivision. Is that right? Luke: That’s correct. That is right. Luke: There can be also requirements on how wide the block is, how much street frontage there is. But this is a good starting point to know whether if you’re looking to do a split, whether it’s the right place for you. Ryan: Yeah. Well, it’s a great, great starting point. Because what’s the alternative? Call the council is the only alternative. Ryan: Okay, now we’re looking at Planning Applications. So, what’s this showing? Ryan: So this shows us plans that have been submitted to council, but that haven’t been authorised? Ryan: Let’s say there’s a 20-storey unit block that had been submitted, but it had already been approved, would this come up here? Or, it’s just stuff that’s yet to be approved? Luke: That’s an excellent question. I believe it is the applications. Application level. Ryan: Okay. I don’t know what that means. What does that mean? Luke: Whether they’re approved or not, you have to go in and check. Ryan: Okay. So this is just showing the most recent applications for the area. I can see it’s going back to 2014, so it’s showing the last couple of years. Luke: Yes, for the immediate area. So you can see here, we’ve got houses all around. So we’re not looking at, in this case, what’s happening at the shops. You can see – oh, look at this. So, a neighbor is subdividing, so that’s very interesting. Ryan: Ah! Yup. Cool. Okay, so this is awesome as well. So, if you’re interested in, okay, what are people doing in the area? What sort of planning applications that they have in terms of shops, in terms of commercial buildings or units or in terms of renovations people are doing to houses. You can see all this sort of information, which, again, I would have no idea how to find otherwise. Luke: Yeah. It’s a big mess. You’ve got to go to lots of councils. Particularly, if you are casting a wider net, you don’t want to have to learn all the different ways in which councils make this stuff notified. It’s much easier to go to Microburbs, just search for the address you’re interested in. Ryan: That’s the thing, there’s so many different councils just within Sydney itself. So, if you’re looking at multiple different suburbs, it would be quite nightmare to try and look at this stuff and it’s cool. If you’re not watching, it shows you the address and it shows you a little snippet of what the planning application is. So if someone’s just doing alterations and additions to existing dwelling, someone’s doing additions to a single storey residence, plus modifications to a garage and a driveway. So it’s showing you it’s showing you all this stuff. Yeah. Super valuable. What else can we see? Luke: What else we got? So, we scroll down or let’s close this. Ryan: But wait, there’s more! Ryan: Isn’t Chatswood like a high density of Asian people live in Chatswood? Is that true? Luke: That’s right. That is very true. Chatswood is a real centre, but there is increasing popularity among the more affluent Asians, Chinese in particular, towards the North Shore Sydney because there’s a lot of excellent schools there. There’s NAPLAN public schools as well as a lot of prestigious private schools. So, you often have this pattern where ethnics, when they first arrive in Australia, they are in very tight concentrations with their own people. And then, over time, as they gain in status, they typically aspire to similar things to the rest of us and they will go for suburbs like Lindfield when they make some more money. Ryan: Okay. Cool. Alright. I feel a bit racist looking at this map, but I can see why it would be useful. Luke: Yeah. It’s an important dimension that people are very interested in. So, obviously, we’re not providing an ethnicity score. There’s no right or wrong when it comes to ethnicity. Luke: But if you want to be with a certain type of person or you believe that, for example – in fact, we found from our own data that places where the Chinese go, the property prices go up. There was a strong correlation for that for growth in the past 3 years. I spoke to the financial review about that. So that’s definitely something to watch if you’re an investor. Luke: We’ve made this more broad at this point, so Asian versus English only. Luke: Well, it’s a language family. It’s not a language family. It’s a region from which there are a whole lot of languages. It’s a broader categorization because, obviously, a lot of places, you’ve got a large number of ethnic groups. Maybe not so much the case in Lindfield, but you might have a large number of ethnic groups from a particular area and it doesn’t look so nice in a pie chart to have them broken down really granular. Religion as well. Ryan: Yup. I think this will be super useful to home owners because they will be able to see. Especially if they were ethnic themselves and they wanted to live around people of the same ethnicity, then they could find the areas where people like that tend to congregate and look into that. Luke: Absolutely. Yup. So, yeah, we’ve got ethnicity. We’ve got birthplaces and languages. So, languages will be more indicative of people that are seeking to maintain their culture and birthplaces is more just their origin. Luke: You got religion as well. So No religion is a predictor of gentrification and hipness. So if you’re an investor that’s interested in that kind of growth, then that’s one to look at. Here, you’ve got this breakdown for the individual languages as well. Ryan: Cool. Alright. So I’m looking and I’m seeing a Family score now, 8 out of 10. What does that mean? Luke: Yeah. So, that means that it’s a good place for families, which is pretty well agreed upon. So people go there when they’re going to have kids. You can see we’ve got the school catchments. So if you mouse over this, you can see where the primary schools are. And if I mouse over that, you can actually see where this individual primary school is that fits into the catchment for Lindfield. Ryan: Does it actually show you catchment areas? Because I know they go across suburbs. Ryan: Does it actually show you catchment areas for the schools? Because I know they often go across multiple suburbs. Luke: Yes. Yes. So, this is more relevant when you’re looking at an individual address. You get the same report when you do an individual address. Ryan: Okay. It shows you what catchment area it’s in. Luke: It gives you the school for that particular address, yes. Ryan: Yup. I’m just wondering – because this would be a use case because I’ve personally experienced this myself. Can I actually look at an area and say, okay, here’s a school like Lindfield Public School, where’s the catchment area for Lindfield Public School? Or, where’s the catchment area for Vermont Road Public School? Can I see that? Luke: We don’t currently display the catchment area itself, but we have it in the database, obviously. You can also – we have this Find Your Ideal Suburb tool where you just specify that you only want suburbs that have top 20% at NAPLAN. Luke: Next to the school we’ve got how long it takes to get there and you can even see the route map here. We also give you the actual ranking for the NAPLAN scores. So the My School website gives you a lot of various statistical information, band charts and things, but we break it down to just a simple ranking. Ryan: Yeah. So I can see top 1%, top 1%, top 3%, top 4%, top 5%, top 2%. So, obviously, a lot of good schools in the area. So, if schools were a draw card for people, definitely, probably want to look at Lindfield, hey? Luke: That’s right. Regardless of whether you’re into the public school system, the Catholic system, you can see here top 3%, or you prefer private schools, really good performance. It’s only Mercy Catholic, it’s hard to say it’s a bad school, but you know, that’s only top 8%. So we’re looking for all of these public and private schools, primary and high school top 10%. However, if you go down to the day cares, it’s a different story. We rank think these as well, based on accreditation data. You can see that now it’s a lot less about – maybe there’s less focus on this, but you can see that there’s a massive variation in the quality of day cares. So, there is one that’s just below average. Here, there’s one that’s way above average. This accreditation data, I don’t believe anyone has really presented this in an excessive way. Ryan: No. This is awesome. I can see myself reverse engineering your tool to look at schools around my area. I live on the Gold Coast so I can see it to look at what are the best schools and I could find out who’s in the top X% and also, for day cares, if I was looking for a day care, I could look at different areas and say, okay, well, what’s the best day care? And I could quickly cancel out day cares that weren’t up with their accreditation or you know? So, yeah. Luke: Yeah. Day cares is a big deal. Families often aren’t aware, if you move into a new area and I can certainly say here in Sydney, there is waiting lists for the good day care. So, the day care you get in to, is typically not the best day care. Ryan: Yup. Yeah, great to see. Okay. What else is there? Let’s keep moving on. Luke: Yeah. We also look at out of school hours care. So, if you want to work – like if your both parents are working, then that covers that. Sometimes, these are accredited as well. Vacation care. So, do you have to work over the holidays? And of course, playgrounds. Luke: So you can see here where they are and how far, how long it takes to get to them. Ryan: Okay. There’s a lot of information, hey? Ryan: Oh, I’ve lost you there. Lost your sound. Luke: Families in this suburb are one parent, but there’s a lot of childless couples. But the biggest proportion is couples with kids under 15. Ryan: Okay, cool. So you can see if you’re interested in living in an area with young families, you could work that out. Ryan: So what about the Affluence Score? That’s something that I’m sure investors will be interested in. Luke: Absolutely, yeah. So, this here is looking at – we’ve got what we call a heat map or a choropleth map for median income. And you can actually zoom in and get this to be quite fine-grained. So this is down to level of about 400 people. So you can mouse over and see the different spots. So, for example, in Lindfield, let’s not go too far out here. The East side of Lindfield here is known to be quite affluent, but along the main road here it’s less so because of noise and high density. You can see as we go down towards Chatswood West, it’s getting to be – it’s Lane Cove North – it tends to be a bit cheaper. So there are just a lot of knowledge that people have of an area. If you show this to someone who knows the area very well, they’ll say, oh, yeah, that’s right. This is a way, if you don’t know the area, to see at a glance. So for Lindfield people, what are known to be affluent parts? Because people will arrive in a high-status suburb like Lindfield, but if they’re on the wrong side of the tracks and they realize that they haven’t, but other Lindfield people don’t see them as so high-status and a lot of them will actually work until they can afford a house on the other side of the tracks where there’s a different kind of architecture. Ryan: Yeah, I can definitely see investors using this to overlay on top of the prices of houses and if there’s a greater than average income in the area that could potentially lead to growth or maybe they want to invest in areas that have lower levels of income, so definitely useful there. There’s a tool called Ripehouse where you can find out what percentage of public housing is in each of the individual spots, like of 400 people. Is there a way you can do that to find out in Lindfield or in whatever council we’re looking in, can we see what percentage of public housing is in that area, like in that suburb? Luke: We give this small map here, but we do have this information. It’s going to stay narrow, but yes. Ryan: That’s alright. Narrow, but better than nothing. Luke: I understand that Ripehouse is a paid service. Luke: But we have available for free this information. So, you can mouse over and find out. Ryan: Yeah. It’s showing you the small sections of suburbs and you can see, obviously, red is a higher percentage of public housing. These areas are more affluent, so there’s less public housing, but if you’re looking at maybe a more regional town or something like that, or you’d go into an area, you can just quickly see where the government housing is. Because sometimes, it is really concentrated in certain pockets and you may want to avoid that. Or, some investors actually like to invest into that because you get better yields. So, yeah, awesome. Okay. I did want to check that and it’s awesome to see you can do it. Luke: Yeah. There are certain suburbs like here I’m showing Hunters Hill, which is an affluent water side suburb, but there are certain pockets that are very high in public housing, right? Ryan: Oh. Is this 55% public housing in that one section? Luke: So that is a big block. And here is another big block for public housing. Ryan: Yeah. Because I often see investors go into areas, obviously, the area is quite affluent and then they go, I found this property, it’s a steal. It’s so cheap. But they don’t realize it’s right next to high density public housing and that’s why it’s cheap and then they get there and they’re like, oh, I don’t feel safe. I don’t want to live here anymore. So awesome. Love it. Love it. Luke: Yeah. So, for all of our data, you can click on these little icons here and get the heat maps. We’re going to fix it. Ryan: You click on the little map icon, do you? Ryan: It would be great to just click on it and then it does the overlay on the map that’s on the right already. Luke: That’s on the way. Yes, that’s a great feature and we’re working on it. It does it for some now. It does it for more and more, but yes, for all of these, you’d be able to simply mouse over and it will update over here. Ryan: Yup. Great. Guys, we’re looking at here, we won’t go through all of them, but just so people know, you can do public housing, you can do overlays of percentage of renters in the area. So you can see where there’s more renters or where there’s more owner-occupiers. We can do the income, which we already looked at. What else can we do? Oh, the tenancy rate of an area. And then, you can even do employment and stuff as well. So it’s showing you all the stuff that you would get from census quick stats is displayed here, but displayed in a much better format. So, census quick stats is basically gone in my books in terms of using that to find out demographics of an area. It’s probably going to be from Microburbs from now on. Luke: That’s correct. And you can see that when it’s green, that means that it’s better than the average for the comparison area. So here we’re comparing Lindfield to Sydney. If you search for a particular place in Lindfield, I believe it will compare it to the Lindfield council area. So, you can, very quickly, at a glance, see what’s better or worse for a particular stat. So, yes, we’re covering occupations and education. So you can see employment status, even how people vote. Luke: Green voters is another predictor of gentrification. Ryan: Okay. So we’ve then got – wow, we got so many things – Safety Score, Lifestyle Score. Do we want to go through all these individually, do you think? Luke: If you have time, I’m happy to do it. Ryan: Yeah, yeah. I’ve got some time. Alright, let’s go Safety Score. What’s this going to show us? Crime rates of the area. Luke: Yeah. So this is all the crime rates for all the crimes from low to high. Luke: You can zoom in and see that it’s a safe place. Lindfield in general. It didn’t get a perfect score because of the centre here where, obviously, where there’s a lot of people, there tends to be more crime. You can actually break this down by a particular type. So if you believe that a particular type of crime is going to affect property prices or it’s for your own personal interest. For example, domestic violence is probably more about the partner that you take with you. Whereas, non-domestic violence is what your neighbours might inflict upon you. Luke: We’ve got thefts, stealing for money. Ryan: So if we hover over each of these, does it change the overlay on the map? Oh, yeah, I can see robbery there’s none in the area. Ryan: Okay. So it changes the overlay so you can see the areas where there’s more breaking and entering and so you might want to avoid those areas. Luke: That’s right. And you can zoom out really far and it’s really fast as well. Ryan: Yeah. It seems to respond quite quickly, which is great. Yeah, so you can see. Yeah. Awesome! Luke: Yup. Just while we’re on crime, if you want to see it on a local council area level, you can actually see these trends over time. I know investors love trends. Luke: So the ability to see how it compares to New South Wales and what direction these crime levels are headed in and you can break that down very specifically here as well. Ryan: Okay, wow. Alright. Yup. Lifestyle score. We all care about lifestyle, we want a good cup of coffee around the corner. Ryan: Well, I guess, if we’re looking at a property is shows the distance from the property we’re looking at purchasing. How far is it from my morning coffee? Luke: Exactly, exactly. That’s right. Yes. Ryan: I’m secretly wishing that this pull data from Beanhunter about how good the cafes are in the area, but I think that’s a bit too much of an ask. Luke: Yeah? Well, we’re very interested. We’re always looking at more data sources and we’re very interested in cafes and whether they serve smashed avocado or just normal avocado. Ryan: Yup. Smashed avocado is a sign of a good café. Luke: Which is an interesting predictor of gentrification. Another thing is that you can actually use this to find out how many cafes are within a certain region. I believe there was a study done in London that found that the density of cafes was a predictor of property growth. Luke: So you can see here we’ve got 18 within 4 km. Whereas, somewhere less funky is going to have, might have 18 within 10 km. Ryan: Is this pulling data from Google Maps or something? Luke: Yes. Google Places. Yes. Luke: So the same is true for bars, restaurants. You got reviews. Gyms. Beaches. Public pools, got to change the name on that. All the kinds of stuff that you might enjoy outside your area is in lifestyle. Ryan: Yup. Cool. Let’s go down to the next one on the list. I think I saw Convenience. Luke: Convenience. Yup. So how quickly can you get into town, how quickly can you get to the supermarkets, shopping malls? There, you can see Chatswood being highlighted down there. Nearby bus stops. Train stations. And also, what the population does. There might be a bus stop nearby, but is it really practical to take the bus to work? You get a sense of that based on how many public transport commuters there are, which also makes a very interesting heat map. Ryan: Yup. Yeah. This is cool because you can see, okay, to Sydney CBD, it’s 44 minutes with the train and the walking as well. And then, Chatswood’s 20 minutes for train and walking. So, yeah, it’s cool that you can see that sort of stuff. So you can say, okay, I know I’m working in the city. How long is my commute likely going to be? Luke: That’s right. I’ve seen other places, they would just provide the number of metres, but, really, when you’re trying to go to work, you want to know how long it’s going to take. So, we’ll tell you. Ryan: Yeah. That’s the thing. You can’t fly like an eagle in a straight line to get to work. You’ve got to walk to the train station then catch the train, you know. So it’s definitely good to be able to see that. And then, if you’re on a train line that doesn’t go directly to the city, you’ve got to transfer. Luke: Absolutely. Yeah, so there’s a wide difference in quality of train lines and obviously, some stations like Chatswood, every train stops at it. Whereas, there are smaller stations where if a train stops at your station, then it’s going to stop at every station. Ryan: I’ve got a friend who lives in Como, which is in the Southern end of Sydney, and that’s one of those stations. There’s express ones, but they all go through Como. So, if you’re catching the train from Como, it’s going to stop at every stop on the way to the city. Ryan: Okay. So, what about Tranquility? What’s that? Luke: Tranquility. Here, we’re looking at does this provide a peaceful life? Ryan: Okay. It’s all red. Ryan: Okay. What do you mean larger roofs? Luke: I beg your pardon? Ryan: I don’t understand what you’re saying. What are we trying to find out here? Luke: Oh, you find out how the land is being used. Ryan: Okay. Alright. Oh, whether it’s commercial. What’s green? Luke: If you want to know, then you can see at a glance, is that a prison or something? Then, you can learn actually that it’s education. So, one would expect there won’t be noise late at night from that one. Ryan: Okay. And what’s green? Luke: Green is nature. Park land. And you can see here this is Lane Cove West, if I’m not mistaken. And that’s an industrial area. Ryan: Yeah. I would definitely advise going with like a blue for residential or something, not a red. Luke: So, we give you population density and the proportion of tenants. Leafiness as well. And for the future, what’s the maximum building height. Ryan: Yup. Okay. Alright, now we’re on to Hipness. Luke: Yup. So, Hip score, we’re working on at the moment. This is really about does it provide you that funky life? Typically more appealing to people in their 20’s. We’re telling you where the single men and women are and we even have heat maps so you can go see our single women heat map. [Inaudible 35:25] also this microburb level. All the detail is down to a microburb level if you specify an address. Ryan: So, if you were looking for single women and you wanted to go door-knocking to find a partner, you could use this heat map to do that. Luke: You could. There were certain places where there’s going to be unit blocks. You could find out where you should live and hang out and get talking to women in the lift. Ryan: Yup. Very nice. Okay. Cool. Luke: Here, you can see there’s 22% single women. Ryan: What is the use case for this? Is someone going to want to know how many single women or single men are in an area? Luke: Yeah. Well, it’s a sign of people – it’s a sign that it’s a lifestyle where you can meet new people. It’s a more fluid thing. People would be more open, they’re not couples. That is appealing to a lot of people, particularly in their 20’s, but also people that just like that kind of lifestyle. And it is also saying about the hipness, how funky the place is. Luke: We have Diversity as well, which is looking at is there at least one parent born overseas? That was a strong predictor of property price growth, which is quite interesting. Creative Degrees, it’s specifically people that had done kind of your creative arts society and culture fields. That tends to go up in hip sort of areas. Quite proportional people are actually currently in tertiary education and of course, the hipster’s on their bicycles. Luke: Communication Score as well. So this is something that a lot of people will take for granted. They assume when they move to a new place, they’ll be able to watch Youtube. You might find, if you’re an investor that there’s a fair bit of churn if you’re place is in a mobile black spot. Even if the tenant’s not aware of it. If they can’t have the kind of Netflix-Youtube lifestyle that they’re expecting, they could be nicking off more often than you expect. So, we provide so you can see here that in around Lindfield’s quite a hilly area that the mobile quality degrades here. So you’re not getting your 4G coverage and I believe it gets even worse as you go – there are certain spots up North. There are spots here where, according to this map, there is no coverage at all. Luke: Yeah. For Optus and for Vodafone as well. Ryan: Oh, sweet! Vodafone’s looking good for Sydney, aren’t they? This would be cool if you’re like, okay, my contract has ended. I need to find a new phone company. Where do I live? Where do I travel? What’s going to give me the best reception that I use most of the time? Luke: Yeah. I don’t know that Vodafone and Telstra were measured in the same way. So, I would be careful about checking that for yourself. I think Telstra’s coverage, in general, would be better than Vodafone’s from my experience. Ryan: Okay. So, really look at the Telstra map as probably your primary source of information. Ryan: Well, Telstra’s going to have the most relevant score, aren’t they? Because they would have been measured the most and stuff? Luke: Yes. So, we take into account all those things. We’re looking at the broadband. Another big deal is often there’ll be one kind of broadband that’s really good and another that’s bad. So you might sign up for ADSL because that’s what you got at your last place, but in actual fact, it’s really cable because you’re too far from the exchange and the quality of the signal degrades the further you are from the hub where the internet is being delivered from the hub where the internet is being delivered from. Just trying to use basic language here. Ryan: Does it show where the – it doesn’t show where the exchanges are, does it? Luke: Often, we do have ADSL speeds as well. Luke: So we’ve got fairly detailed info there. Ryan: Yeah, awesome. Because I know, I’ve lived right near the exchange in Burleigh and then I’ve lived far away from the exchange and the difference is immense in terms of speed. Ryan: Cool. Okay. So, that’s cool. Community score. I’m guessing we’re getting towards the end, hey? Last three? Luke: We are, we are. Thank you for your patience in running through all this, but I hope it’s interesting. So, Community score is more about being able to interact with people. How strong is the community? So, it’s not about commercial things, but clubs and religious institutions and council facilities. So you get a sense of how long people stick around. You can see here that Lindfield is about average for Sydney, but they have a very high level of volunteerism. It’s quite interesting, they’re volunteerism goes up really high when you go a little bit back from the train station. Ryan: Okay. Interesting. Alright, and what’s the Local Government Area Stats? Luke: Sorry? What’s that again? Ryan: The Local Government Area Stats, just below Community Score. What’s this sort of stuff? Luke: Yes. So, now, we’re getting to more council information so you can find out how long it takes to do a development application. Ryan: Alright. This, I think, is going to be valuable because you can see all the property I’m looking at or an area. I can see exactly what council it’s in. I can see the population and the growth in population. As well as the growth in the number of households, which is a good one to look at because if there’s a lot of developments in the area, that can affect demand and supply ratio. And then, you can see the number of development applications average day per application and construction certificates. So you can see if an area takes a long day to process and application and you want to do a development, then that’s going to affect your lead times, hey? Ryan: Cool. This is cool. Luke: Demographics stuff for the council as well and your developments. What kinds of development types. Ryan: Okay. So we can see alterations, houses, commercial. Ryan: Yeah. You can see most people are doing alterations. There’s houses – they’re building new houses or they’re just editing their house in some way? Luke: I would believe it would be a new house. Luke: Editing is alterations, but you’d have to check that to be sure. Ryan: And then you can see New Multi-unit, which is going to be valuable to a lot of people looking in areas. Because if there’s a lot of new multi-units, then there’s going to be a lot of supply on the market. Do you know how long it pulls this data from? Like, is this the last 12 months, last 2 years? Luke: I believe this is 2014 data. Ryan: Okay. So, will that adjust as the years progress, will that continually be updated to 2015 and 2016? Luke: Absolutely. Yup. As the data becomes available, we’ll put it up. Ryan: Okay. Cool. Alright. Does it show in Development exactly what’s being developed? Or that’s the chart we just looked at? Okay. Yup. Luke: Yeah. You see the kinds of things there, but then you’ve also got applications by price bracket. Luke: And you’ve also got – very interesting is to see the trends. Ryan: Okay. So, what’s this thing? Luke: Only the 2015 with this data and you can see that there is a big flurry of unit developments in – I believe that would be – yeah, so that’s July and then it’s really gone down since then. Luke: Some supply and now it’s come down. Often councils on the North Shore really fight development. And if you’re in a council like that, then, obviously, you’re in a good position for owning a unit because of the restricted supply. Ryan: Yup. But then, you’d also want to look at this big peak in applications back in July 2015 and when they’re going to actually come about in terms of completion. Luke: Very good point, yes. Ryan: Because that’s the thing, it’s dropped off in terms of the number of applications, but we don’t know when that sort of stuff is going to actually come to market. Though, I don’t know if there’s a way to find that out, but you could call your council and talk to them and I guess find out what applications were – I don’t know. Luke: Finally, you get a flavour of neighbourhood by looking at the photos. What people get up to. Nice, bushy. Ryan: Where do these photos come from? It doesn’t look like Instagram. Luke: So, yeah. We also have a Find Your Ideal Suburb tool. Ryan: Yup. Hey, can I just ask you – before we go into that, if we were looking at an individual property, would it be all the same reports we just went through, but it would be specified to the property in terms of distances and things like that? Is that the only difference we would be seeing? Luke: That’s right. So the distances and also the demographic data goes down to the level of the microburb. Luke: So this particular small area here, these couple of blocks, that’s the data that you’re seeing there. Ryan: Okay. So you’re not seeing the data on the suburb that property’s in, you’re seeing the data on the microburb or the small section of that suburb the property’s in? Luke: That’s right, yeah. So it’s all about knowing what the neighbours are going to be like, rather than what this large, diverse thing called the “suburb” is about. Luke: Yeah. We have an Ideal Suburb tool as well. So, if you can specify exactly what you’re after – don’t be too greedy. Like, don’t ask for a place under $500,000 near the city by the beach with top NAPLAN. You’re not going to find a satisfactory result. But if you put something that’s realistic, then you can get a list of suburbs that match that. Ryan: Okay. It says “bedrooms” there, “2”. Will that show 2 and more bedrooms, or just 2-bedroom properties? Luke: It will be quoting the price for 2-bedroom properties, yes. So, if there isn’t stock for 2-bedroom properties, I believe it will exclude those ones. Ryan: Okay. That might be something to look at, to look at “between 2 and 4 bedrooms” or “2 or more bedrooms” or something like that, rather than individual bedrooms. Luke: Yeah. So, to a degree now, if you want to try the different options, you might go back and alter the search. But, yes, that’s good feedback. Ryan: But that’s cool. So, if you can say, okay, I want to know areas that have high NAPLAN schools, let’s say in the top 5%. Can we look at areas, like, can I say, “The Gold Coast, but I want NAPLANs to be in the top 20%”? Ryan: Can I narrow it down to that? Ryan: Yup. Gold Coast, Tweed Heads. Ryan: Let’s say that’s all I care about. Luke: Okay. So we don’t need Short drive to the city or keep that in anyway. Let’s put this up to critical, so we say that’s the most important thing. Ryan: Okay. So it’s showing you Ashgrove, Queensland. And then it’s gone to WA. Luke: Yeah. That’s a little bug there, I have to confess. Ryan: Okay. That’s alright. This is still very new software. I think you guys have been out for a bit over 6 or 7 months now. So, I’m sure it’s going to continue to be better. Luke: This particular feature is very fresh and new and we’re working on a new version of this. Ryan: Yup. And I think to see tools like this, to see microburbs.com.au, we just talked about myrealestate.com.au. I also interviewed a guy from dsrdata.com.au. I think if you combined those, you got myrealestate.com.au to search for the individual properties in a better way. You got microburbs to find all about your suburbs and that the suburb is like – all the demographics sort of stuff. And then you’ve DSR Data to look at capital growth trends in the area and sales data and things like that. Do you guys do sales data and capital growth trends at all at the moment? Luke: We do have sales for a fair bit of New South Wales. Luke: So yes, we do have some sales data there. Previous sales, but yeah, there are other sources for that information. Ryan: Yeah. I think you guys are definitely narrowing down the amount of different places that I need to go to get information. I used to go to Census Quick Stats. I used to go to Walk Score and I used to go to a whole bunch of other places as well to find out information about an area. And a lot of information that you guys have, I just didn’t even know about. Like finding out the top schools of the area. Even having public housing as well. Having all those map overlays. This is going to be a super valuable resource to people who are either buying a home or they’re looking to buy an investment and want to understand an area. And I’m going to tell my buyer’s agent friends about this and people in the industry. I’m can tell you right now, they’re going to froth on it. It’s pretty good. Luke: Right. Yes, thank you very much! We are always working to add more data. To become a complete tool to give you all the information you need in one place. Ryan: I would just encourage anyone out there. Go ahead and check out microburbs.com.au. I’ll just spell it out for your guys, it’s M-I-C-R-O for “micro”, B-U-R-B-S for “burbs” and then you guys know “.com.au” because that’s all the Australian websites. So you can go ahead. Go ahead, check it out. Try maybe the suburb you live in and find out stuff about your suburb that you didn’t know. Or, use this when you’re looking at a suburb or you’re looking at a potential property to invest in to really understand the area. We talked through a lot of different things today. I guess, you don’t have to go through all of it, but find the things that are important to you. Whether it be schools or ethnicity or public housing in the area or cafés or all that sort of stuff. Luke, I just want to say a massive thank you for taking your time today to show us through the tool that you’ve created. Thank you for offering it for free as well. And I wish you the best, definitely. Is there anything that you wanted to say to people before we close out? Luke: Yeah. Do your homework. Like you say, there are tools now that provide a lot of transparency for this. So don’t just go for the pretty pictures. Cast yourself a wider net than previously you would because there might be suburbs that fit your criteria that you hadn’t thought of before and using a tool like Microburbs can really make that clear and give you a good idea of what your life would be like or what the investment would be like if you went ahead and purchased. Ryan: Yup. And I can see a lot of different use cases for this tool. I’m just looking at the homepage now. Like commute times, you could say, “I want to have less than 1 hour commute to the city” and you can find all the areas that have that and that can narrow down your search. There’s so many different things that we went through. I absolutely love this tool. Alright guys, I’m going to go ahead and leave it at that. I wish you all the best in your suburb research. We have a great new tool that you can go ahead and look at. Again, it’s microburbs.com.au, which you already know. But go ahead, check it out and use it next time you look to invest in property. And until next time, guys, stay positive.